Clever canines can do something which not even our closest relative, the chimp, can manage. They can follow the human gaze or a pointing hand, figure out what it is we are looking at and seek out the target. Dogs have spent thousands of years living with humans so a Hungarian research team set out to investigate whether this cunning ability came from wolves, the genetic ancestors of today's dogs, or developed during domestication. Dr Adam Miklosi, at Eotvos University in Budapest, compared the abilities of dogs with hand-reared wolves to find hidden food from human cues, such as pointing. These experiments are the first ever performed with such highly "humanised" wolves, brought up with round-the-clock care from volunteers in Dr Miklosi's department. The wolves could find the food when their handler either tapped the correct hiding place or pointed from a close distance. They also eventually learnt to track down their dinner by following pointing from a distance. Dogs had no trouble with any of the tasks. However, the real difference came when the researchers tested the dogs and wolves in a tricky situation. Food was hidden in a bin or on the end of a rope, and the animals got used to opening the bin or pulling the rope to get the bait. But when the bin was sealed shut, or the rope tied down, the main contrast between the two became clear. Dogs frequently looked back at their master while wolves just kept their heads down and tried to solve the problem. Wild wolves generally tend not to look at human faces, and not even careful hand-rearing of the wolves could change this behaviour. In contrast, dogs have a tendency to follow the human gaze as they are accustomed to looking at our faces for clues. This difference in the behaviour between the humanised wolves and dogs tells us that they must have picked up this ability during domestication, over the past 15,000 years. Dr Miklosi said: "Looking at the gaze or engaging in eye contact is a typical human signal, so dogs could be said to be using a behaviour that is analogous to ours." It has been suggested that the ability to follow a gaze demonstrates an understanding of mental states, indicating a "higher mind". Although many dog owners would claim their pets are almost human, Dr Miklosi suggests "it is very difficult to prove whether these behavioural features correspond to human behaviour. "I would not say that dogs have a higher intelligence but a different one. 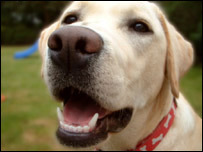 Dogs are said to be 'dumb' animals because they are provided for by humans. "But we think that dogs have adapted to the human and acquired skills to survive here. "As we know, one needs social skills to survive among humans, so it seems that dogs have acquired them, too."